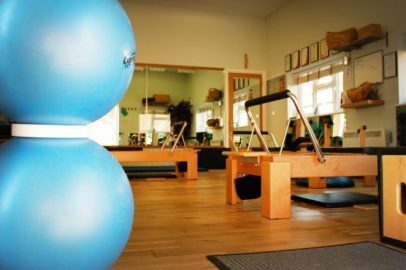 Gecko studio has a recently refurbished apparatus room with a range of Pilates equipment. These machines (often referred to as reformers) support small group classes and enable our clinicians to offer extensive rehabilitation programs to our clients. A reformer is perhaps the most renowned and versatile of all Pilates equipment. A reformer glides forwards and backwards on rollers using springs for resistance, along with other attachments, for a wide variety of exercises and positions. It facilitates hundreds of exercise variations, is no-impact therefore easy on the joints, has modifications for those with injuries and is suitable for a wide variety of people from beginners to elite athletes. We advise you to come in for a consultation to discuss your aims and goals. Your trainer will advise you on the various options to help you achieve them. This also allows us to place you in the most suitable class. The group classes are 1 hour long and run in courses of 4 weeks. One-to-one sessions can be arranged for 30 or 60 minutes. Our bespoke studio is based in Yattendon. Please click here for the map.